Located on a tree-lined boulevard with jogging trails, this elegant Georgian-style inn is a local historic landmark. To visit Angel Arbor is to be magically returned to the early 1920's, to the stately brick residence built originally for John and Katherine McTighe. 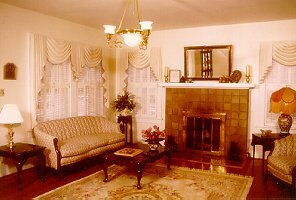 The first floor of the Inn boasts an antique filled parlor, reading room, formal dining room and a sunroom for games or casual dining. A wicker furnished solarium overlooks the backyard garden, and artfully placed angel statue. Upstairs, six bedrooms each contain queen bed and private bath, four with whirlpool tubs.. Also, a separate outside suite provides seclusion with sitting room and deck.. Full delicious breakfasts are served. Attractions: Galleria shopping, Astrodome and Astroworld, largest medical center in the U.S.A., Space Center Houston, museums, fine restaurants. Receptions, teas, private parties, conferences, original murder mystery dinner parties. RATES: $95-125, AE/MC/Visa/Discover. Corporate & Single Rates Available. 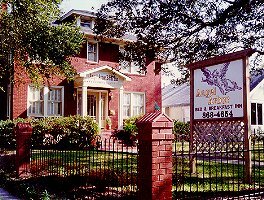 This and other Houston Bed and Breakfast Inns can be found here in The Register.